The artist was among the innovators in art. His work reached its highest level in the 10s of the 20th century, when the steppe and Bukhara series, exemplary in their impeccability, appeared, which include the “At Work” canvas. The best canvases of the “Kyrgyz suite” are distinguished by true grandeur, picturesqueness, a thorough understanding of the spirit of the East and its slow power. By this they go to the philosophical level. 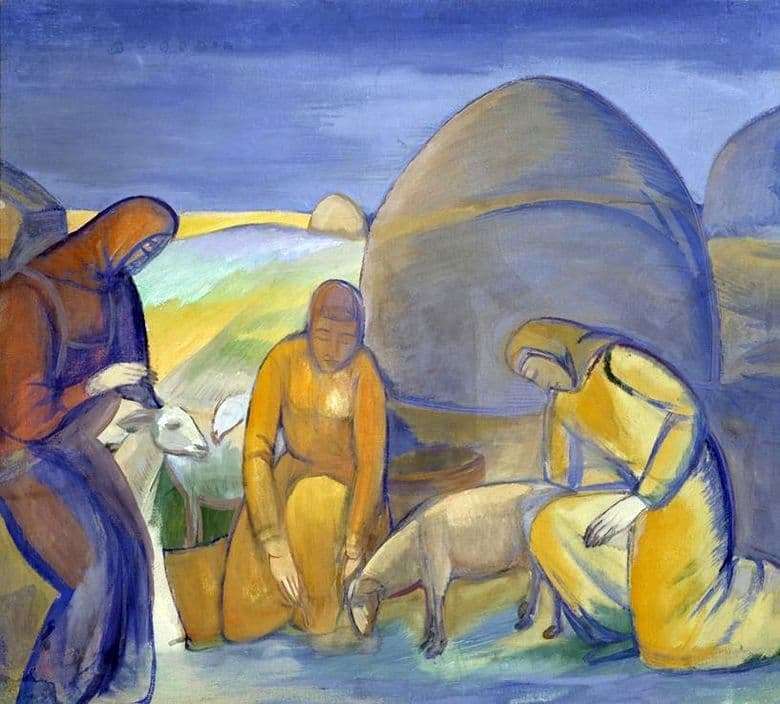 In the foreground, the painter depicted Kyrgyz women engaged in daily routine work – sheep shearing. They are immovable, as if petrified, and stately as the ancient steppe goddesses are harmonious with the endless earth and the boundless sky. The artist’s writing technique is canonical; he observes a kind of permanent rules. In how the picture is built, the image on it is constructed, how the human types are interpreted, echoes of ancient Russian traditions are visible. The picture feels the hand of a subtle colorist, adoring the combination of quivering shades, halftones. At the same time, the picture resembles a fresco: it is demonstratively planar, as if conceived to connect with architecture. In it, Kuznetsov’s true style is noticeable – the commonwealth of sacred lyricism and thoroughness, epic. The artist creates a world of immediate people, real life. He glorifies the way of life of the Kyrgyz, their exceptionally expressive, colorful and plastic costumes, despite all the brightness of the color. It glorifies the purity and transparency of the air with its haze, the majestic steppe ships – camels, herds of horses, from which they receive koumiss, flocks of sheep, which are cut by hostesses, patterned carpets are naive, trustful, hospitable people who lead natural economy. All this gave him a lot of new impressions and material for thought and reflection. Kuznetsov in his picture plays with the space through decoration. The blueness of the background underlines the twilight time, the reflections in tone on the cats resemble the period of the “Blue Rose”.